"As light as a feather, yet as hard as dragon scales." "Mithril! All folk desired it. It could be beaten like copper, and polished like glass; and the Dwarves could make of it a metal, light and yet harder than tempered steel. Its beauty was like to that of common silver, but the beauty of mithril did not tarnish or grow dim." — Gandalf, The Lord of the Rings, Book II, Chapter 4 "A Journey in the Dark". Mithril is a fictional metal from J. R. R. Tolkien's Middle-earth fantasy writings. It is silvery and stronger than steel but much lighter in weight. The author first wrote of it in The Lord of the Rings, and it was Retconed into the second, revised edition of The Hobbit in 1966. 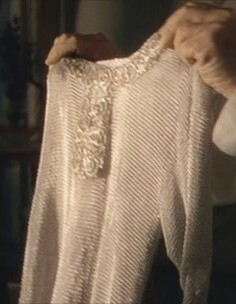 In the first 1937 edition, the mail shirt given to Bilbo was described as being made of "silvered steel". This metal was the reason for the Dwarves of Khazad-dûm's wealth and power. Greed for this metal eventually led to the downfall of the dwarves when they found a vein of mithril that led to a sleeping Balrog. The name "mithril"note For the curious, mithril in Sindarin (Elvish) means "grey glitter", the -ril part being the same as in Silmaril. In Quenya (the classical language of the Elves) it was mistarillë. or similarly spelled variations (mithral, mythril, mythral, and others) is present in other fictional contexts like role-playing games, since the Tolkien Estate did not trademark the term, unlike "Hobbit" or "Balrog". One early example is Dungeons & Dragons and its derivatives (e.g. Forgotten Realms). It appears in many computer and video games such as The Elder Scrolls IV: Oblivion (it also appeared in The Elder Scrolls II: Daggerfall, although there it was a mid-weight material), EverQuest, RuneScape, Tales series, Dark Age of Camelot, Dungeons & Dragons Online, Diablo, Terraria, World of Warcraft, Final Fantasy,note Final Fantasy curiously makes mythril a very low-grade metal obtained in the early-game, as opposed to the stuff of legend it typically is. Kingdom Hearts and NetHack. The name is usually used for a special type of metal (often used as armor), or as a denomination of currency, or as a name for a project or device. It's very useful to have an exotic trope metal that is more rare and valuable than mundane metals like steel or gold. Citadel Miniatures even produced a color of (metallic) paint named Mithril Silver. Subtrope of Fantasy Metals. Compare with Thunderbolt Iron, Orichalcum, Unobtainium, Silver Has Mystic Powers. Contrast with Cold Iron. Not to be confused with Heavy Mithril, or the fictional mercenary organization of the same name.